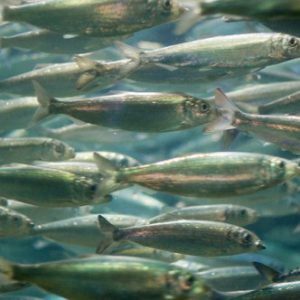 Forage fish-small to medium-size fish species such as anchovies, sardines and mackerels-constitute 37 percent of total global landings from commercial fisheries. Historically, humans in all areas of the world have consumed such fish directly; however, because their tendency to aggregate in large numbers makes the cost of catching them relatively low, and because their nutritional value is quite high, they are valuable components of food for poultry, pigs and, in particular, carnivorous farmed fish. In a 2008 issue of Annual Review of Environment and Resources, Jacqueline Alder of the University of British Columbia and colleagues argue that the amount of forage fish taken is of concern given the importance of such fish to a number of marine predators. For example, research has shown that these small pelagics constitute about 12.5 percent of all the food consumed annually by the world’s seabirds, and that alcids (puffins and murres) and larids (gulls) account for about 75 percent of the small pelagic fish that all seabird species eat. Even this level of consumption, however, is “at least eight times lower” than the amount fisheries catch, report Adler and colleagues. They suggest that direct competition between fishing operations and seabirds is not a significant threat to avian species with large foraging ranges because much of these fisheries’ impact is expected to occur around relatively localized hotspots. They write that the most common type of harmful competitive interaction will be one in which fisheries adversely impact birds with restricted distributional ranges or localized populations, such as North Sea populations of black-legged kittiwakes. Adler and colleagues note that, although fishmeal and fish oil derived from forage fish are beneficial in the intensive production of poultry, pigs and ruminants, they are essential to most carnivorous farmed fish. Accordingly, as aquaculture has expanded, so too has the industry’s proportion of the forage fish catch. The researchers write that under a growing aquaculture industry, increased demand possibly combined with declining supplies will mean that the price of fishmeal and fish oil will likely rise, ultimately increasing production costs. This could lead to consumers paying more for farmed fish and people in developing countries finding that forage fish are priced out of their range. Source: Adler, J., et al. 2008. Forage fish: From ecosystems to markets.Annual Review of Environment and Resources 33: 133-156. Contact: Jacqueline Alder, University of British Columbia.